Disclaimer: These objects are not scans or mechanical reproductions, but hand-drawn replicas of Kinder objects. 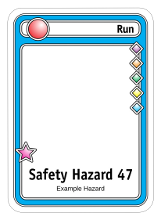 These objects are intended to allow fans to create non-commercial Fan Art Cards to supplement their KinderBunnies® decks using the out-of-print Bunny Blanks or similar. They are intended to be used for “Fair Use” purposes only. Each group of optional elements on separate image layers. Many background colors and patterns are available merely by making them visible, including the Play Right Now! pattern. Major card types (including Run, Special, Very Special, and Play Right Now!). Full bleed for white card background. GIMP-friendly XCF and Adobe Photoshop-friendly PSD multi-layer image formats. Regardless of who drew these particular objects, United States copyright law says these objects are © 2008-2010 Playroom Entertainment. “Fair Use” says you may use them for personal, non-commercial use only. Many of the items in the Kinder Library were drawn with Inkscape as the drawing tool. Inkscape runs on Windows, Mac OS X, and Linux. The icon indicates a Scalable Vector Graphics (SVG) graphic suitable for importing into Inkscape or Adobe Illustrator. The icon indicates a Portable Network Graphics (PNG) graphic suitable for use in GIMP, Paint.NET, or Adobe Photoshop. The icon indicates an XCF graphic suitable for use in GIMP. The icon indicates a Gzipped (compressed) XCF graphic suitable for use in GIMP. GIMP will directly read and write to xcf.gz files. The icon indicates an Adobe Photoshop PSD graphic suitable for use in Adobe Photoshop, Adobe Illustrator, or other software that will read the PSD format, such as GIMP. Killer Bunnies® and Kinder Bunnies® are registered trademarks of Jeffrey Neil Bellinger.